Simply place this in front of you, within arm's reach, and use the instructions to call upon a spirit, entity, or Immortal of the Astral or Spiritual Realm, have the time to interact, converse, and experience each other's company, and if a spirit is willing to be bound, it can be done through this powerful amulet. This is a fantastic opportunity for you to experience and interact with the billions of spirits & entities out amongst the Astral & Spiritual Realms. There is so much that can be learned from discovery of new races and species that you have never interacted with before. It can also help you to see the diversity of races you already know. You can also use this to interact with the countless Immortal beings who reside within the Astral Realm. They can be life-changing guides when it comes to Destiny & Fate. Through this you can interact and communicate with Immortals of any kind! The instructions come in downloadable .pdf upon completion of purchase. Vessel is a bowl which will be fantasy-themed. 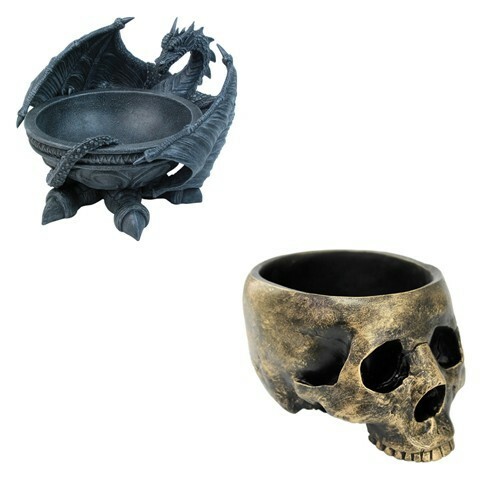 Two examples are shown, most bowls are resin and range in size from 5"-10" in diameter depending on their shape.